The pest control company stands ready to protect Columbia residents and business owners from bed bugs, termites, wildlife, and more, reports caycebugs.com. Cayce Exterminating Company is pleased to announce the official opening of their brand-new Columbia location. For over 50 years, the company has been serving residents and business owners in throughout the Midlands of South Carolina with honesty, integrity, and professionalism. The Cayce Exterminating team stands ready to help homeowners in the area fight every type of pest, from armies of tiny mosquitoes to dangerous rats and raccoons. As an insured and licensed exterminator in Columbia SC, Cayce Exterminating Company offers a comprehensive suite of pest control services, including termite protection, nuisance wildlife control, and bed bug extermination. As a full-service company, the Cayce team is also able to provide home repair and remodeling services which help homeowners correct structural issues, repair damage caused by pests, and protect and enhance their home’s value. Visit caycebugs.com to learn more about Cayce Exterminating Company and find out how an experienced exterminator from their team can help you eliminate your pest problem once and for all. Cayce Exterminating Company was founded in 1963 by David H. Day Sr. on the values of honesty, integrity and superior service. Today, Cayce Exterminating has grown into a full service, residential and commercial pest management and home repair business located in the Midlands of South Carolina. Their team continuously strives to maintain a legacy of satisfied clients by providing prompt, professional and quality customer service. Their motto, “Your Pest. OUR Problem.”, enforces their commitment to these values. As a second-generation company, family-owned and operated by David H. Day Jr., Cayce Exterminating is continuously expanding their services to meet the changing needs of their valued customers. 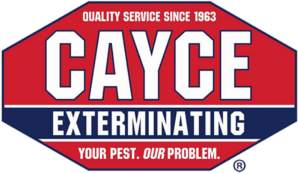 Organization: Cayce Exterminating Company, Inc.